The veneration of ancestors (zongzu 宗祖, zuzong 祖宗, xianzu 先祖, zuxian 祖先) was in traditional China the most widespread form of religion and was an integral part of Confucian propriety, belonging to the so-called "auspicious rites" (jili 吉禮, see Five Rites). From the Han period 漢 (206 BCE-220 CE) on, dynastic founders (kaiguo huangdi 開國皇帝) were called zu 祖, and all imperial ancestors were given the title zong 宗, together with a descriptive epithet, the temple name (miaohao 廟號), like "the Martial", "the Cultured", "the Valiant", "the Majestic". The earliest progenitor receiving veneration is called shizu 始祖, his oldest son is the first opening a "large lineage" (dazong 大宗), while younger sons founded lateral lineages (xiaozong 小宗, see zongfa 宗法 lineage system). The word zufu 祖父 also means "grandfather". The original meaning of the word zong 宗 is "ancestral temple" - a combination of a roof (宀) and "spiritual matters" (示), while the word /tsu/ 祖, combined of "spiritual matters" (礻) and the phonetic /tsĭo/ 且, meant "to spread out a mat to deliver offerings" (Shuowen jiezi zhu 說文解字注). Ancestor veneration is attested in oracle bone inscriptions of the Shang period 商 (17th-11th cent. BCE) The Shang used various names for different ancestral sacrifices, like zong 宗, sheng 升, jia 家, shi 室, or ya 亞 (see Shang religion). The reigning dynasty represented the state, and all state affairs, like war, alliances, or agricultural activities, had therefore to be announced in the ancestral temple (zongmiao 宗廟, taimiao 太廟, zumiao 祖廟). The "state sacrifices" or "public sacrifices" were called guoji 國祭 or gongji 公祭. The encyclopaedia Baihu tongyi 白虎通義 from the Han period explains that zong 宗 meant "to venerate" (zun 尊), and miao 廟 "appearance [of the ancestral spirits]" (mao 貌). The protection of the ancestral altars was an important matter. When an emperor left the capital for some reason, his Heir Apparent was made resident regent (liushou 留守) to keep an eye on the ancestral temple and the altar of the spirits of land and grain (sheji 社稷). The ancestral temple was also a place of social events, for instance, the gathering of a family cluster, political conventions, banquets, sacrifices, capping (guanli 冠禮) and funeral rites, the report of victory (gaojie 告捷), etc. All important matters of the state had to be reported in ceremonial form at the ancestral altars (guo you da shi, bi ji gao zongmiao 國有大事，必祭告宗廟, and similar phrases). Also in literal expressions, the word "ancestral altar" was a synonym for "the state" or "the dynasty", for instance, "the ancestral altars fading away" meaning "state power declined". The ritual Classic Liji 禮記 (ch. Jifa 祭法) explains that sacrifices should only be delivered to "those who had given [good] laws to the people (fa shi yu min 法施于民), those who had laboured to the death in the discharge of his duties (yi si qin shi 以死勤事), to those who had strengthened the state by laborious toil (yi lao ding guo 以勞定國), those who had boldly and successfully met great calamities (neng yu da zai 能御大菑), and to those who had warded off great evils (neng han da huan 能捍大患). A commentary says that people had to deserve the title by their merits (zu you gong 祖有功) or by their virtue (zong you de 宗有德). Confucius' disciple Zengzi 曾子 explained that the ruler may pay "careful attention to perform the funeral rites to parents, and let them be followed when long gone with the ceremonies of sacrifice, for then the virtue of the people will resume its proper excellence." (shen zhong zhui yuan, min de gui hou 慎終追遠，民德歸厚; Lunyu 論語, ch. Xue er 學而). The aim of ancestor veneration from the side of the ruling house was thus not only to accomodate the spirits or souls of ancestors as if they were still living, but also to prepare for the good of one's own spirit, and finally, for the social order in the whole empire. The ritual prescriptions of the Zhou dynasty 周 (11th cent.-221 BCE) reserved seven temples, fanes or shrines (qimiao 七廟) for the Son of Heaven. These temples were quite likely arranged in a conversed U-shape, with one position for the high ancestor in the middle and two wings in front of it, each wing consisting of three temples. The two wings were called zhao 昭 "illustrious", and mu 穆 "majestic", respectively (see zhao-mu system). The genealogical rank of the ancestors was thus arranged crosswise, with the shrines of the older generations located closer to the high ancestor. The history book Guoyu 國語 (ch. Luyu 魯語 1) explains that the zhao-mu system served to bring "chronological order into the generations" (ci shi zhi zhang-you 次世之長幼) and to "grade the proximity or distance of offsprings" (deng zhou zhi qin-shu 等胄之親疏). Some interpretations believe that the altars were standing in one line, but excavations in several regional states of the early Zhou period proved the U-shape form of tomb arrangement, which was quite probably imitated in the temple structure. According to legend, the mythological emperors Yao 堯, Shun 舜, and Yu the Great 大禹 had built five ancestral temples (for five generations), the Shang dynasty six (for Xie 契, Tang the Perfect 成湯, and the latest four generations—yet this number might also refer to the yin sacrifices 禋 to sun, moon, the stars/polestar, rivers, mountains, and the sea), and the Zhou seven. In the early Western Zhou, the ancestral sacrifices were carried out at the burial site. King Wu 周武王, for instance, delivered sacrifices at Bi 畢, where his father King Wen 周文王 was buried. Yet the kings soon began to replace tomb sacrifices (muji 墓祭) by sacrifices in the temple (miaoji 廟祭). For this purpose, the zhao-mu system, in which the tombs were arranged, was reflected in the arrangement of shrines or fanes in the ancestral temple: the zhao 昭 wing to the left, and the mu 穆 wing to the right. An alternative arrangement saw the ancestral altars (zong 宗) to the left, and the altar of the deity of the soil (she 社) to the right. The regional rulers (zhuhou 諸侯) of the Western Zhou period 西周 (11th cent.-770 BCE) were allowed five temples for their ancestors, the grand masters (dafu 大夫) three, senior servicemen (shangshi 上士) two, and ordinary and junior servicemen (zhongshi 中士, xiashi 下士) just one. Commoners (shuren 庶人) were not allowed ancestral altars. The Liji (ch. Quli 曲禮 A) therefore says that "the [ancestral] rites did not concern the commoners", and the Confucian scholar Xunzi 荀子 (ch. Lilun 禮論) confirms that "those who eat by the labour of their hands are not permitted to establish a temple to their progenitor". The ancestral temples of the regional rulers were called shishi 世室 or taishi 太室, that of their ministers and grand masters gong 宮. The seven shrines—which signified the seats of the ancestral souls—of the Son of Heaven included that for the father (kaomiao 考廟, mimiao 禰廟), the grandfather (wangkao miao 王考廟, zumiao 祖廟), the great-grandfather (huangkao miao 皇考廟, zengmiao 曾廟), the great-great-grandfather (xiankao miao 顯考廟, gaomiao 高廟), and the great-great-great-grandfather (zu kaomiao 祖考廟). More distant forefathers (yuanzu 遠祖) were venerated in two shrines called tiaomiao 祧廟. The temples for the latest seven generations were called "paternal temples" (qinmiao 親廟). The Liji chapter Jifa 祭法 described the seven temples rather as elevated altars (tan 壇) with a periphery (shan 墠). The High Ancestral Shrine is located in the centre, to the left and right of it the "interspace shrines" of the zhao and mu generations into which the ancestral tablets of progenitors older than six generations above the presently ruling king were standing. The left and right wings were were occupied by the ancestors of the zhao and mu generations, respectively. This designation was an alternating system. If the father was mu, the grandfather must have been zhao, and the present king also. The great-grandfather again was mu. Such reconstructions of the Zhou ancestral temple are only tentative. With the advancement from generation to generation, the seats of the ancestral souls in the temples were exchanged and the older ones shifted to the shrines closer to that of the high ancestor (qianmiao 遷廟 "shift the [owner of the] temple", or huimiao 毀廟 "give up the [seat] in a temple"). Accordingly, distant forefathers were shifted to two "interspace" shrines (jiashi 夾室, zhao and mu) located left and right of the High Ancestor's shrine. When a king of the zhao generation died, the ancestral tablets (shenzhu paiwei 神主牌位) of the whole zhao wing were moved one position higher, and accordingly, when a king of the mu generation died. The only exception of this movement was the spirit tablet of the High Ancestor which remained in his central place. This repositioning of ancestral tablets was only carried out when the three-year long mourning period for a deceased father was finished. The bestowal of a posthumous title was not immediately carried out. The time between the obitus of an emperor and the bestowment of a miaohao title, the official title was daxing huangdi 大行皇帝 "the Emperor on His Long (Eternal) Journey". Apart from the ancestral temple (zongmiao 宗廟), the Han dynasty created shrines at each of the imperial tombs (huangling 皇陵, lingmu 陵墓). In each tomb garden (lingyuan 陵園), a shrine was founded (lingqin 陵寢), the tomb of an empress (huanghou 皇后), secondary consorts (huangfei 皇妃, feizi 妃子), princes (huangzi 皇子), princesses (gongzhu 公主), or high dignitaries. The shrines there consisted of a "sleeping chamber" (qindian 寢殿), and an "entertainment chamber" (biandian 便殿). It was believed that the soul (linghun 靈魂) of the emperor was sleeping and active during the day, as are all living persons. The entertainment chamber was believed to be the space where the soul could stroll around. Sacrifices were carried out in the main shrine (yuanmiao 原廟) outside the two chambers. The Han also ordered that each commandery erect an ancestral altar of the dynasty. In some instances, the word lingqin is used to refer to the tomb itself or the "sleeping chamber" (qin 寢) inside the tomb hill (shanling 山陵, shanfen 山墳). Because the tomb areal (yingyu 塋域) usually included a park, the temple is also called "garden chamber" (yuanqin 園寢). Yan Shigu 顏師古 (581-645), commenting on the official dynastic history Hanshu 漢書, remarks that only the tomb mound itself was given the appearance of a park (yuan zhe, yu ling zhang zuo zhi 園者，于陵上作之). The tomb hill of a dynastic founder was usually called Changling 長陵 "Oldest Hill", and the others were given designations corresponding to the lifestyle and achievements of their "owner", like Kangling 康陵 "Hill of the Strong One", Dingling 定陵 "Hill of the Stable One", or Xianjieling 顯節陵 "Hill of the Manifest-Economical One" (Emperor Ming 漢明帝 of the Han), while others were called according to the location, like Baling 霸陵 "Hill on River Ba 灞" (Emperor Wen 漢文帝 of the Han), or Shouyangling 首陽陵 "Hill at Shouyang" (Emperor Wen 魏文帝 of the Wei). The temple where the ancestral tablet was located and the spirit believed to reside was usually located in the front, and the "sleeping chamber", i.e. the mound—with the coffin and the many tomb furnishings—, in the back, so that the whole construction resembled the arrangement of a palace, with the court (chaoting 朝庭) in front, and the private chambers (gongqin 宮寢) in the rear. Thus, the main hall of the temple (zhengqin 正寢) was accompanied by one or several side halls (biandian 便殿). Each tomb was protected by a guard. The Former Han 前漢 (206 BCE-8 CE) tomb temples were desecrated by the Red Eyebrow 赤眉 bandits. When Emperor Guangwu 漢光武帝 (r. 25-57 CE), founder of the Later Han dynasty 後漢 (25-220 CE), decided to take his principal residence in Luoyang 洛陽 (Henan) far away from the tombs of the dynastic ancestors in Chang'an 長安 (Xi'an 西安, Shaanxi), he united all twelve ancestral tablets of the Former Han in a single high ancestral temple (gaomiao 高廟) dedicated to the dynastic founder Emperor Gaozu 漢高祖 (r. 206-195 BCE). At that occasion he eliminated the ancestral tablet of Empress Dowager Lü 呂太后 (d. 180 BCE) because she had practically ruled, but was not an ancestor of Gangwu's lineage. From then on, the Han used only one single building in which all ancestral tablets were arranged in the zhao and mu positions, yet in separate chambers (tong tang yi shi 同堂異室). The creation of the single ancestral hall might alternatively go back to the decision of Emperor Ming 漢明帝 (r. 57-75 CE), who wanted his soul be venerated in the shrine of his father, and not a separate one. The Wei dynasty 曹魏 (220-265) revived the seven-temples system. From the Tang period 唐 (618-907) on, the dynasty had nine temples or shrines, as the two tiaomiao temples were regularly integrated into the sacrificial rites. This system was confirmed by the Song dynasty 宋 (960-1279). Emperor Shenzong 宋神宗 (r. 1067-1085) of the Song built the Jingling Palace 景靈宮 in Qufu 曲阜, Shandong, with eleven halls and no less than 1,320 rooms. The ancestral tablets, bearing the names of the ancestors, were supplemented by portraits of each ancestor and his primary consort, later also by such of their most important civilian and military officials. The family name of the Song dynasty was Zhao 趙, and Emperor Shen identifed the Yellow Emperor 黃帝 (Xuanyuan 軒轅) as the first progenitor and "Holy Ancestor" (shengzu 聖祖) of his house. The Grand Temple (taimiao 太廟) of the Ming dynasty 明 (1368-1644) was located left of the Duanmen Gate 端門 on the southern side of the Imperial City (Zijincheng 紫禁城). For a short period during the Jiajing reign-period 嘉靖 (1522-1566), the nine-temple (jiumiao 九廟) system was revived. Noble families and such of state officials imitated the ancestral altar of the reigning dynasty, and built a family temple (jiamiao 家廟 ) on the eastern side of their residences. All temples consisted of two rooms, namely a sacrificial hall (miao 廟) to the left, and a "bedchamber" (qin 寢) to the right. By and by, even commoners used to have their own shrines, but not necessarily with two chambers. Such private ancestral shrines are called citang 祠堂. The rites performed are described in Zhu Xi's 朱熹 (1130-1200) "house rites" Zhuzi jiali 朱子家禮. A particular veneration of all ancestors was carried out in the first month (mengyue 孟月) of each season, and once in the 12th lunar month (layue 臘月, see calendar), the end-year offerings (laji 臘祭). When an emperor succeeded to the throne, his first duty was to report his accession to his ancestors, assemble the ministers, and receive the state seals. This procedure was called "audience in the ancestral temple" (miaojian 廟見). In the course of the year, an emperor performed monthly offerings (yueji 月祭), seasonal offerings (sishi zhi ji 四時之祭 or zhengji 正祭) and "collective sacrifices" (yinji 殷祭). The ancestors "laid aside" to the tiaomiao shrines received veneration once each season, and in special ceremonies once every three years. It was custom during the Zhou period that the king at the beginning of winter handed over to the regional rulers a calendar (lishu 歷書) for the coming year. It informed about intercalary months (runyue 閏月), the first day of each month (shuori 朔日—a procedure called bangao shuo 頒告朔). The regional rulers used this calendar for the sacrifices in the ancestral altar of the Zhou. This local ceremony was called gaoshuo 告朔 "announcement of the First [to the ancestors]". When the sacrificial ceremony was over, the regional rulers were lectured in the High Shrine (taimiao). 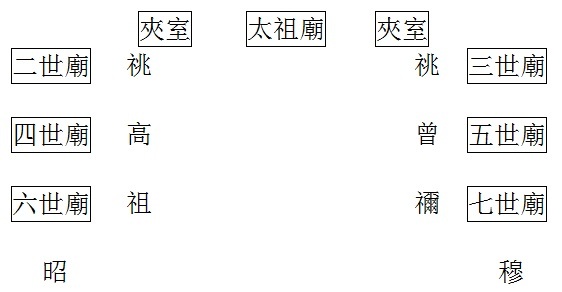 This was called "arranging the First" (shishuo 視朔). After being lectured, the monthly offerings were carried out. The sacrificial ceremony to the Zhou ancestors was given up in the Eastern Zhou period 東周 (770-221 BCE), even if the custom of offering of a sheep remained. The seasonal offerings had a different name for each season, namely yue 礿 in spring, ti 褅 in summer, chang 嘗 in autumn, and cheng 烝 in winter. Alternatively, the spring offerings were called ci 祠 and the summer offerings yue. The seasonal offerings were carried out in honour of the three earliest ancestors (santiao 三祧). During the Spring offerings, fresh leek (jiu 韭) was presented, in Summer, wheat (mai 麥), in Autumn, millet (shu 黍, ji 稷), and in Winter, rice (dao 稻). The "collective" yin offerings were a large ceremony carried out once every five years in shape of the summer offerings (diji 禘祭), and once every three years for all ancestral spirits together (yinji 殷祭 or dashi 大事 "grand affairs"), consisting of the "collective" xiaji 祫祭 and the "attentive" diji 禘祭 (zhuisi dadian 追祀大典) ceremonies. The xiaji sacrifices were for the first time carried out (in the tenth lunar month) when the three-years mourning period was over, and the diji rites (in the fourth lunar month) a year later. Thereafter, the xiaji sacrifices were repeated in three-year intervals, and the diji sacrifices in five-year intervals. Apart from these large sacrificial ceremonies, the Han dynasty also presented "interstitial offerings" (xiansi 閑祀), the most important of which was the presentation of double-fermented wine (zhouji 酎祭 or changjiuhui 嘗酎會) which was carried out in the eighth lunar month. The imperial princes participated in the ceremony and contributed gold (zhoujin 酎金). Such offerings could also be presented spontaneously, like for instance, ripe cherries. At the end of the sacrificial ceremony, the emperor climbed the tomb hill (shang ling 上陵). The rituals were arranged and overseen by a ritual assistant (binxiang 儐相), either a minister or grand master (then called daxiang 大相) or a serviceman (xiaoxiang 小相). From the Han period on, the emperor was during the sacrifices accompanied by a large entourage. The minutiae of the ceremony are described in the official dynastic history Houhanshu 後漢書 (94-96 Liyi zhi 禮儀志). The emperor of the Later Han visited the tombs of their forefathers when they toured to the west, and occasionally visited the tomb of the forefathers of Liu Xiu 劉秀 (Emperor Guangwu, Zhangling 章陵) in Zaoyang 棗陽, Hebei. The seasonal visit of the imperial tombs was called sishi xingyuan 四時行園. The Former Han, still residing in Chang'an, used monthly to carry around the dynastic founder's cap and robes to imitate an imperial inspection tour (yiguan chuyou 衣冠出游). The ancestral sacrifices were carefully prepared by clearing and ornating the altar, selecting the executing officials, prognosticating the auspiciousness of the day, and fasting rites (zhaijie 齋戒) by the performer. The group then entered the great hall (taishi 太室), of the temple and performed the libation rites (guanli 祼禮) with a ceremonial libation cup of jade (guizan 圭瓚) containing fragrant wine (xiangjiu 香酒) which was spread on the soil into the four directions. In this way, the ancestral spirits would be evoked to come down and receive the offerings, consisting of sacrificial animals, fresh fruits, and various types of grain. The king or performer knelt down and kowtowed while offering these objects. The sacrificial offerings were distributed among the participants when the ceremony was over. According to the book Chunqiu waizhuan 春秋外傳 (i.e. Guoyu 國語), the sacrifices to the sun (jiri 祭日) were combined with ancestral offerings (zumi 祖禰). They were therefore carried out in the "sleeping chambers" (qin 寢) four times on that day by offering food to the ancestral spirits. Offerings to the moon (jiyue 祭月, yuesi 月祀) were carried out at the ancestral altar, and those to the seasons in the royal "rest palace" (biandian 便殿). From the Han period on, sacrifices at ancestral tombs or shrines were usually carried out in the middle (zhungxun 中旬) of the 7th lunar month, for a period of three days. On the first, the soul was invited, on the second, the main sacrifices took place, and on the last day, the soul was bid welfare. The custom of tomb offerings (muji) spread through all social classes from the Tang period on. They were performed at Qingming Festival 清明節 ("Tomb-Sweeping Festival") or the 15th of the 7th lunar month, or the 1st of the 10th month. Offerings were presented at the imperial tombs at the first (shuo 朔) and fifteenth (wang 望) day of each lunar month, at Newyear's Day (yuandan 元日), and the solar terms Dongzhi 冬至 and the day Hanshi 寒食 (one or two days before the term Qingming), as well as on the hottest day of summer (furi 伏日), and during the last month of the year (layue). The imperial father was offered food and fresh crops daily. During the Song period, the ancestral shrines (zongci 宗祠) were twice each year a place of extended offerings, once in Spring (New Year), and once in Autumn (Qingming Festival or the solar term Dongzhi). They were performed by the family head, and all family members participated in the sacrificial ceremony. When the "family offerings" (jiaji 家祭) were finished, the clan was united in a banquet and entertained by music and theatre. In north China, the family assembled three days after the enterment (chubin 出殯) performed the "tomb-warming" rites (nuanmu 暖墓). The Southern Song 南宋 (1127-1279) emperors delegated the duties of ancestral sacrifices at the tomb to functionaries, and rarely carried them out in person (xingjian 省視). The Ming dynasty, whose founder laid great stress on rituals, performed five sacrifices per year (New Year, Qingming, 15th of the 7th month, 1st of the 10th month, and Dongzhi) by offering a cow (tailao 太牢), but this duty, too, was carried out by the tomb supervisor (shoulingguan 守陵官). The Qing dynasty 清 (1644-1911) offered one cow at the tombs close to Beijing, and two cows at the tomb hills in the Eastern Capital (Dongjing 東京) Mukden (Qing Zhaoling 清昭陵, the tomb of Hong Taiji, and Qing Yongling 清永陵, the tomb site of remote ancestors), and a cow and two sheep at the tomb of the dynastic founder Nurhaci (Qing Fuling 清福陵). At the anniversaty of death, birthday, and the 15th of the 7th month, incense and cadles were lit, fruits and wine presented, as well as daily necessities (dianbo 奠帛), prayers pronounced (duzhu 讀祝), and rituals performed. At the 1st and 15th day of other months, dianbo and duzhu rites were not performed in front of the ancestral tablets of the male and female progenitors. The ritual regulations of the Qing foresaw the presentation of one coin (zhibi 制幣), 18 dishes of food and broth, 65 cakes and fruits, as well as wines. On the day Dongzhi, the rituals were simpler. Ceremonies carried out at the tombs of consorts were also much simpler. The private offerings of the Aisin Gioro family (the Qing dynasty) took place in the Palace Temple (tangzi 堂子, in Manchu tangse) on the first and fifteenth day of each month, barring the first lunar month, for which an auspious day was chosen. The sacrifices took place in the Fengxian Hall 奉先殿 which was located in the eastern parts of the Imperial City, close to Jingyun Gate 景運門. The hall went back to the early Ming period with a the Guande Hall 觀德殿 in the west and the Chongxian Hall 崇先殿 in the east, but both was destroyed in the disturbances before the Manchus took over Beijing. The Qing temple was finished in 1657. When an empress died before her husband, her ancestral tablet was put into the lobby (qiashi 夾室) and was only "brought to rest" (feng'an 奉安) into the main hall when her huband had passed away. A particular custom of the Manchus was that certain kill during the autumn hunts at Mulan 木蘭 in Manchuria were directly sent as presents in the ancestral altar. Since the Qing period, the ancestral sacrifices take place on the festivals Tomb-Sweeping Day (Qingming), New Year's Eve (chuxi 除夕 – with the "collective" sacrifices xiaji), danchen 誕辰 (anniversary of the birth of a particular progenitor), jichen 忌辰 or guoji 國忌 (anniversary of the death), and zhongyuan 中元 (15th of 7th month), each of the four mengyue months, and monthly when offering fresh crops of the season (jianxin 薦新) like fruits or grain. The typical traditional form of ancestor veneration are offerings on New Year's eve which took in old Beijing place in front of a portrait hanging at the north wall of the Main Hall. Before the portrait, a small table was standing on which incense and candles were lit and offerings deposited, for instance, fruits or fried candy sticks arranged in the shape of a pagoda (migong 蜜供) and decorated by flowers (gonghua 供花). The objects to present water/wine, fruits, flowers, candles, and incense, are called wugong 五供. Cao Shusen 曹樹森, Zhang Xuecheng 張學誠 (1998). "Zuzong 祖宗", in Tang Jiahong 唐嘉弘, ed. Zhongguo gudai dianzhang zhidu da cidian 中國古代典章制度大辭典 (Zhengzhou: Zhongzhou guji chubanshe), 1145. Chen Wenliang 陳文良, ed (1992). Beijing chuantong wenhua bianlan 北京傳統文化便覽 (Beijing: Beijing Yanshan chubanshe), 225, 512. Lei Hong'an 雷宏安 (2002). "Jizu 祭祖", in Zhongguo yuanshi zongjiao baike quanshu bianzuan weiyuanhui 《中國原始宗教百科全書》編纂委員會, ed. Zhongguo yuanshi zongjiao baike quanshu 中國原始宗教百科全書 (Chengdu: Sichuan cishu chubanshe), 334. Li Bingzhong 李秉忠, Wei Canjin 衛燦金, Lin Conglong 林從龍, ed. (1990). Jianming wenshi zhishi cidian 簡明文史知識詞典 (Xi'an: Shaanxi renmin chubanshe), 222. Li Qinde 李勤德 (1998). "Zongmiao 宗廟", in Tang Jiahong 唐嘉弘, ed. Zhongguo gudai dianzhang zhidu da cidian 中國古代典章制度大辭典 (Zhengzhou: Zhongzhou guji chubanshe), 1133. Luo Zhufeng 羅竹風 et al. (1993). Hanyu da cidian 漢語大詞典 (Beijing: Hanyu da cidian chubanshe), Vol. 3, 652, 1347; Vol. 6, 1120; Vol. 7, 844, 947; Vol. 11, 998. Shi Xuanyuan 施宣圓 et al., ed. (1987). Zhongguo wenhua cidian 中國文化辭典 (Shanghai: Shanghai shehui kexue yuan chubanshe), 252, 609. Song Weijia 宋薇笳 (1997). "Zongmiao jisi 宗廟祭祀", in Men Kui 門巋, Zhang Yanjin 張燕瑾, ed. Zhonghua guocui da cidian 中華國粹大辭典 (Xianggang: Guoji wenhua chuban gongsi), 1018. Wu Shuchen 武樹臣, ed. (1999). Zhongguo chuantong falü wenhua cidian 中國傳統法律文化辭典 (Beijing: Beijing daxue chubanshe), 385-386. Xu Xinghai 徐興海, Liu Jianli 劉建麗, ed. (2000). Rujia wenhua cidian 儒家文化辭典 (Zhengzhou: Zhongzhou guji chubanshe), 325. Xu Yu 許鈺, ed. (1992). 中華風俗小百科 (Tianjin: Tianjin renmin chubanshe), 446, 451. Xue Hong 薛虹 et al., ed. (1998). Zhongguo huangshi gongting cidian 中國皇室宮廷辭典 (Changchun: Jilin wenshi chubanshe), 49, 56, 64, 263, 297. Zhang Yonglu 張永祿, ed. (1993). Handai Chang'an cidian 漢代長安詞典 (Xi'an: Shaanxi renmin chubanshe), 355, 356, 357, 358. Zhang Yu 張玉 (2002). "Zuxian chongbai 祖先崇拜", in Zhongguo yuanshi zongjiao baike quanshu bianzuan weiyuanhui 《中國原始宗教百科全書》編纂委員會, ed. Zhongguo yuanshi zongjiao baike quanshu 中國原始宗教百科全書 (Chengdu: Sichuan cishu chubanshe), 874.